Somehow both Anand and I ended up with international versions of Samsung’s Galaxy S 4, equipped with the first generation Exynos 5 Octa (5410) SoC. Anand bought an international model GT-I9500 while I held out for the much cooler SK Telecom Korean model SHV-E300S, including Samsung’s own SS222 LTE modem capable of working on band 17 (AT&T LTE) and Band 2,5 WCDMA in the US. Both of these came from Negri Electronics, a mobile device importer in the US. For those of you who aren’t familiar with the Exynos 5 Octa in these devices, the SoC integrates four ARM Cortex A15 cores (1.6GHz) and four ARM Cortex A7 cores (1.2GHz) in a big.LITTLE configuration. GPU duties are handled by a PowerVR SGX 544MP3, capable of running at up to 533MHz. We both had plans to do a deeper dive into the power and performance characteristics of one of the first major smartphone platforms to use ARM’s Cortex A15. As always, the insane pace of mobile got in the way and we both got pulled into other things. More recently, a post over at Beyond3D from @AndreiF gave us reason to dust off our international SGS4s. Through some good old fashioned benchmarking, the poster alleged that Samsung was only exposing its 533MHz GPU clock to certain benchmarks - all other apps/games were limited to 480MHz. For the past few weeks we’ve been asked by many to look into this, what follows are our findings. Let’s hope this doesn’t get plugged, because it’s actually an extremely useful level of transparency that I wish more mobile platform vendors would offer. Running that command in a loop we can get real time updates on the GPU frequency while applications run different workloads. Running any games, even the most demanding titles, returned a GPU frequency of 480MHz - just like @AndreiF alleged. Samsung never publicly claimed max GPU frequencies for the Exynos 5 Octa (our information came from internal sources), so no harm no foul thus far. 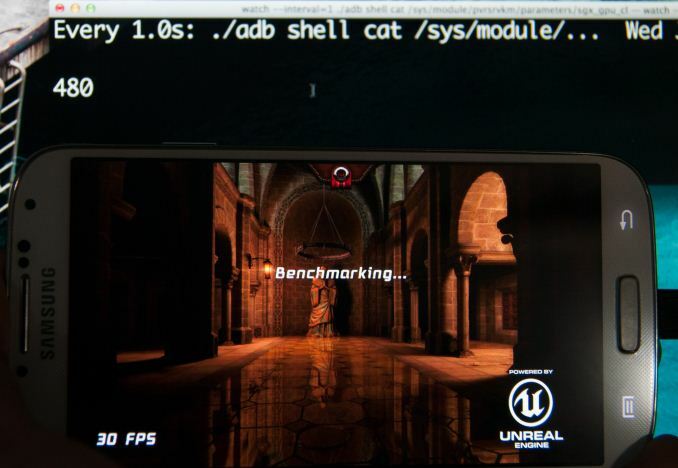 Firing up GLBenchmark 2.5.1 however triggers a GPU clock not available elsewhere: 532MHz. The same is true for AnTuTu and Quadrant. We should see roughly an 11% increase in performance in GLBenchmark 2.5.1 over GFXBench 2.7.0, and we end up seeing a bit more than that. The reason for the difference? GLBenchmark 2.5.1 appears to be singled out as a benchmark that is allowed to run the GPU at the higher frequency/voltage setting. The original post on B3D focused on GPU performance, but I was curious to see if CPU performance responded similarly to these benchmarks. Using System Monitor I kept an eye on CPU frequency while running the same tests. Firing up GLBenchmark 2.5.1 causes a switch to the ARM Cortex A15 cluster, with a default frequency of 1.2GHz. The CPU clocks never drop below that, even when just sitting idle at the menu screen of the benchmark. 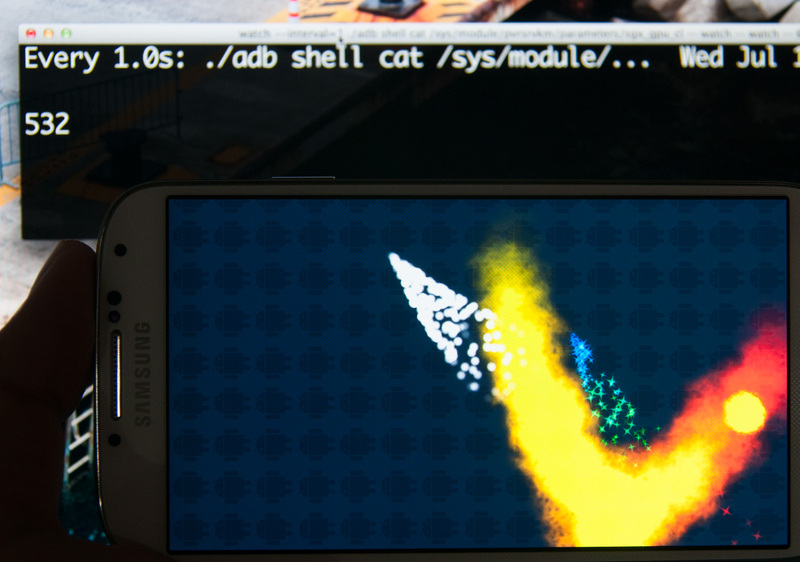 Run GFXBench 2.7 however and the SoC switches over to the Cortex A7s running at 500MHz (250MHz virtual frequency). It would appear that only GLB2.5.1 is allowed to run in this higher performance mode. A quick check across AnTuTu, Linpack, Benchmark Pi, and Quadrant reveals the same behavior. 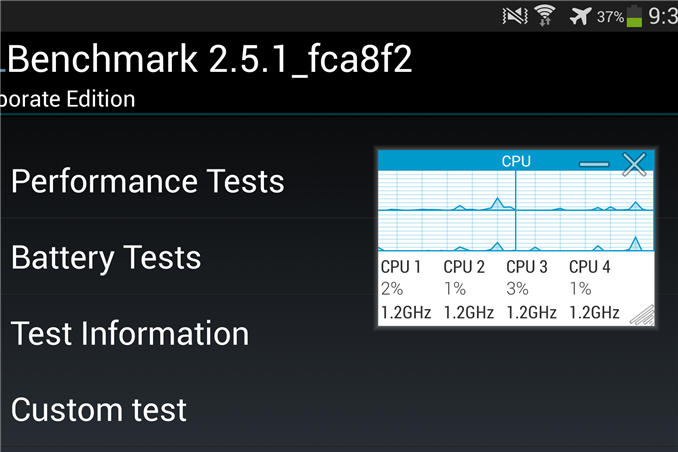 The CPU governor is fixed at a certain point when either of those benchmarks is launched. 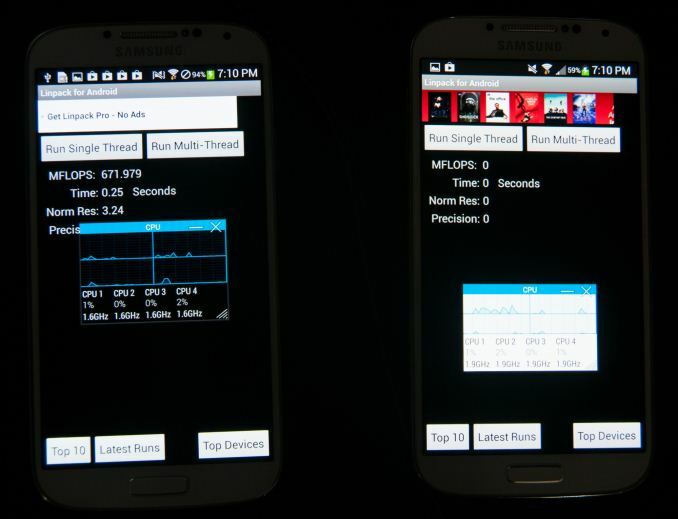 Interestingly enough, the same behavior (on the CPU side) can be found on Qualcomm versions of the Galaxy S 4 as well. 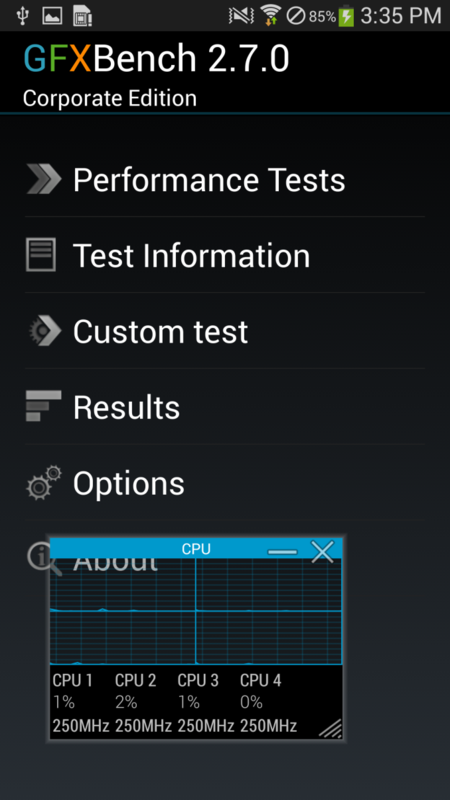 In these select benchmarks, the CPU is set to the maximum CPU frequency available at app launch and stays there for the duration, all cores are plugged in as well, regardless of load, as soon as the application starts. 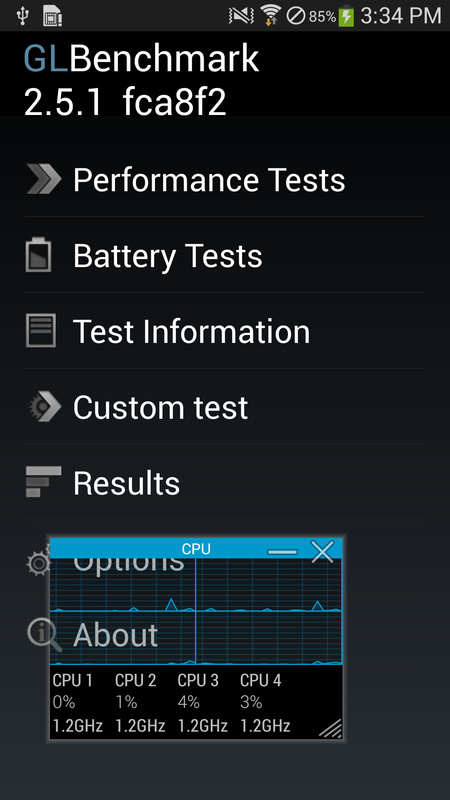 Note that the CPU behavior is different from what we saw on the GPU side however. These CPU frequencies are available for all apps to use, they are simply forced to maximum (and in the case of Snapdragon, all cores are plugged in) in the case of these benchmarks. The 532MHz max GPU frequency on the other hand is only available to these specific benchmarks. You can see specific Android java naming conventions immediately in the highlighted section. Quadrant standard, advanced, and professional, linpack (free, not paid), Benchmark Pi, and AnTuTu are all called out specifically. Nothing for GLBenchmark 2.5.1 though, despite its similar behavior. What's even more interesting is the fact that it seems as though TwDVFSApp seems to have an architecture for other benchmark applications not specifically in the whitelist to request for BenchmarkBoost mode as an intent, since the application is also a broadcast receiver. 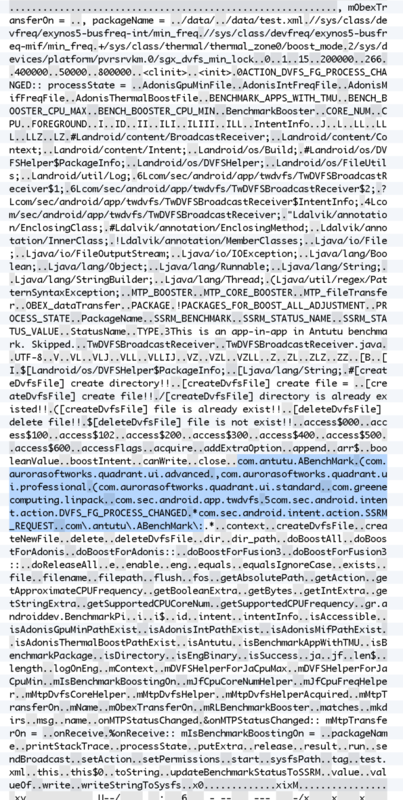 So we not only can see the behavior and empirically test to see what applications are affected, but also have what appears to be the whitelist and how the TwDVFSApp application grants special DVFS to certain applications. None of this ultimately impacts us. We don’t use AnTuTu, BenchmarkPi or Quadrant, and moved off of GLBenchmark 2.5.1 as soon as 2.7 was available (we dropped Linpack a while ago). The rest of our suite isn’t impacted by the aggressive CPU governor and GPU frequency optimizations on the Exynos 5 Octa based SGS4s. What this does mean however is that you should be careful about comparing Exynos 5 Octa based Galaxy S 4s using any of the affected benchmarks to other devices and drawing conclusions based on that. This seems to be purely an optimization to produce repeatable (and high) results in CPU tests, and deliver the highest possible GPU performance benchmarks. We’ve said for years now that the mobile revolution has/will mirror the PC industry, and thus it’s no surprise to see optimizations like this employed. Just because we’ve seen things like this happen in the past however doesn’t mean they should happen now. It's interesting that this is sort of the reverse of what we saw GPU vendors do in FurMark. For those of you who aren't familiar, FurMark is a stress testing tool that tries to get your platform to draw as much power as possible. In order to avoid creating a situation where thermals were higher than they'd be while playing a normal game (and to avoid damaging graphics cards without thermal protection), we saw GPU vendors limit the clock frequency of their GPUs when they detected these power-virus style of apps. In a mobile device I'd expect even greater sensitivity to something like this. I suspect we'll eventually get to that point. I'd also add that just like we've seen this sort of thing many times in the PC space, the same is likely true for mobile. The difficulty is in uncovering when something strange is going on. What Samsung needs to do going forward is either open up these settings for all users/applications (e.g. offer a configurable setting that fixes the CPU governor in a high performance mode, and unlocks the 532MHz GPU frequency) or remove the optimization altogether. The risk of doing nothing is that we end up in an arms race between all of the SoC and device makers where non-insignificant amounts of time and engineering effort is spent on gaming the benchmarks rather than improving user experience. Optimizing for user experience is all that’s necessary, good benchmarks benefit indirectly - those that don’t will eventually become irrelevant.